I'm from California originally, but NW Washington is home. Have worked various driving jobs in the past including Taxi and deliveries but finally decided I was done with minimum wage grunt work. Its been my dream since childhood to roam the open road in a big rig, and this forum was a vital resource while I prepared to get started. 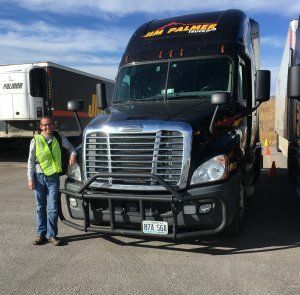 I’m nearly done with my OTR training with Jim Palmer and can’t wait to get into my own truck! Well I finished up the last load with my trainer and am now sitting in my very own truck on my way to deliver the first load of my solo week. Skip, the owners son, ended up deciding to assign me to the western regional fleet after all, I was surprised to find out. I was issued a trailer lock, air brake cuffs, and after a clean dot inspection on truck# 10004 they set me loose on a load from great falls to union city, ca. My new fleet manager gave me his cell number to call anytime in case I need anything and has been a huge help with figuring out the issues that have come up this far. After this I’ll probably have time to do one more before heading back to Missoula for onboarding, which I hear mostly consists of watching safety videos and hr paperwork. I’m really enjoying the peace that comes with driving solo and working independently. Aside from checking in occasionally, my fleet manager is taking a hands off approach to how I run the truck. He says as long as I’m on time, don’t incur unnecessary tolls, and be safe he is happy. I’m loving this! Hi G-town thank you for the reply. I’ll admit that I might’ve been overly harsh with how I worded that but the fact is they recruited me with the promise of working on their regional fleet once I finish training. When they called my spouse for an interview they said I would be home weekly, leaving me to be the bearer of bad news that this would not be happening anytime soon. Also their Facebook page advertises training new drivers directly into the regional fleet. Jim Palmer does just a urinalysis but in addition to the required dot drug panel they perform a pre-employment test that checks for a wider array of prescription/non prescription drugs. The company I’m training with instructs us to use all the tools available to get from a to b. Truckers atlas, GPS, company suggested routing, google satellite images, and most importantly your brain! I compare all sources when figuring out my routing. None are perfect but all are useful. The gps gives live traffic and weather data but sometimes wants to deviate from approved truck routes, the map book is reliable and can’t suffer from technology failure but the downside is it’s out of date already by the time it’s published. The company routing thru Qualcomm doesn’t always follow the best possible route but if you are stuck due to a traffic jam/ closed road/ bad weather it has the upside of plausible deniability because “I was just following orders.” A mix of all sources will give you the most success. Although the recruiting process was fairly straightforward and clear I believe they made the deal seem a little sweeter than it actually is. I was told that because of where I live I would be able to work on the company’s regional fleet which would mean going no further east than Denver and going home once a week for a restart. They said I could even stop at home for a half hour break a few times a week because they have customers in my hometown. They neglected to mention that while the regional fleet is a possibility for me, there’s no guarantee when that’ll happen. Upon checking with my fleet manager it turns out I have to stay OTR “for a while” which means being out 3-5+ weeks between home times. This wasn’t what I signed up for and now I’m kind of stuck with riding out the contract and toeing the line or buying myself out and going to work local. Im not one to job-hop and I feel some loyalty to the company for taking the risk putting me thru training but I’m not thrilled about being stuck in a position that I didn’t sign up for. At this point I’m determined to tough it out and go with the flow but if the company doesn’t follow thru on their promise to me it’ll determine whether I stick with the company after the year contract is up. In hindsight it was pretty naive of me to believe everything I was told... though I hoped this company was a cut above when it comes to caring about the drivers it doesn’t seem that is so. About 6 weeks after returning from my first home time during training my fleet manager was supposed to get me home for a specific date to make it to a family event. When I realized that this wasn’t going to happen based on where we were being dispatched I called up Joe the fleet manager and he said he thought the home time date I requested was more of a flexible thing, when I made it clear before and he understood I was trying to make it for a specific event and gave him several weeks notice that I’d like to be home for that. Maybe this was an isolated incident but it sure didn’t seem to matter to him whether I ever made it home! Overall my experience in training has been positive, the equipment is well maintained, the training is very thorough and time consuming to be sure that I’m ready to go it alone. But I think the company oversells itself to draw in recruits. And as I understand now, this is not unique in the industry. My apologies for not returning sooner to update my training diary. I was disappointed before to find little information about other students’ experiences at Jim Palmer so I really should have kept ya’ll up to date. First week: Arrived at the Missoula greyhound station late Sunday night, shuttle ride to the hotel, and checked in. I shared a room with another student from Washington. Go Hawks! Monday Morning was spent going over contract paperwork as well as training expectations. The training is free if you stay for a year, leave in the first siz months you owe $3500, leave in the second six months you owe $1500, stay for the year and you are debt free! Marc drove myself and the other trainee to the drug test and physical, we both passed! Then we returned to the terminal to finish preparations for the permit test the next day. Tuesday The other trainee and I surrendered our Washington driver licenses, applied for Montana licenses and CDL permits (paid for by Jim Palmer) We both passed our permit tests on the first try and we returned to the terminal to celebrate by taking our first attempts at driving a big rig! Woo hoo! We started by driving around the company yard, perfecting our double clutch technique, after which we took a drive around town to fill the rest of the day. Wednesday- Trailer day! We spent the morning going over what we learned about shifting ranges for the 10-speed the previous day then learned how to hook to a trailer and drove around the yard and then the trainer, Marc, had us drive the DOT road test route that we would return to test on after our permit driving period over the road. Morning was spent practicing backing techniques and shifting some more. Then my OTR trainer showed up! “D Seat” This is the first part of OTR training when I drove with a CDL permit and my trainer rode in the passenger seat all the hours I drove. This part of training is unpaid but I took advantage of the $200/week advances to feed myself andavoid pulling money out of savings. We spent about 3 weeks on the road traversing the country before we were routed back to Missoula for my skills test. We perfected my double clutching technique (required for Montana CDL test), worked on backing techniques, as well as how to run the Qualcomm, deal with shippers and receivers, and do a proper pre-trip. I’m happy to report I passed my skills test on the first try with almost perfect scores! My 90-degree back was a hole in one— no pull-ups! Many thanks to Shannon and Marc for all their tips and tricks I couldn’t have done it without them! “B2 Seat” 10,000 miles This training period was also spent team driving, cross crossing the country with the goal of hitting all of the lower 48 before the end of training so I can experience all possible traffic and weather situations. We saw some really nasty mountain passes during this time, which while they were stressful, really helped my confidence with inclement weather and prepared me to tackle those situations on my own. We went through Pendleton at one point when the chain up law was in effect and my trainer opted to shut down in the chain up area and wait for the restriction to be lifted instead of taking the opportunity to teach me how to chain up a big truck- which I would have preferred. “B1 Seat” Final 10,000 miles BTW the miles required for each training period are all of the dispatched miles for the truck, not just what the student drives so it goes by quicker than you’d think. The first 7500 miles of this training period continue on the trainers truck driving teams, but the final 2500 miles are spent on your own doing a “solo” week before the upgrade to “A Seat” and full fledged truck driver status. As of now I have the miles completed to start my solo week so as soon as we make our delivery this coming Tuesday, we’ll be routed to Missoula for me to pickup a truck to start my solo week. And that’ll be goodbye to my OTR driving trainer. Finally!! After a month long application process I’ve been accepted to Jim Palmer’s training program in Missoula. I originally considered going with Swift or CR England but was enticed by JP’s high starting pay and closer proximity to my home in NW Washington. Also during my application process I was informed that due to a recent acquisition of Haney Trucking of Washington State, I’ll have the opportunity for more frequent home time once I go solo. I have to say it has been a pleasure working with their recruiting department. I could tell from the first call it would be a different experience here than it would have been with the other companies I considered. Unlike the recruiters at other companies, Logan at JP made sure that my husband and I understood the pressures of OTR trucking on the family and even took the time to call him personally for a brief interview to make sure he was ready for the responsibility of running the house alone while I’m gone. Also every claim he made about the company and training program was backed up by facts and in writing, whereas the recruiters from other companies made promises about miles and home time that they couldn’t necessarily keep. Needless to say I am really impressed with the company and can’t wait to get started. I hop on a bus to Missoula Sunday morning and class begins 0700 Monday!